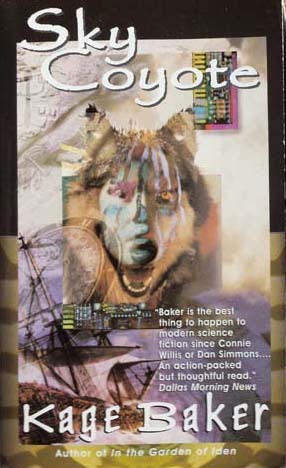 Taking a bit of a break from Hugo stuff (but not really), today I’m talking about Iain M. Banks’ Inversions, which I’m reading along with kamo of this is how she fight start, Brittian from Two Dudes in an Attic, and Matt from Feet for Brains. Head over to their blogs to see what they think of the book so far. Chapter 12 is the magic stopping point for this discussion, and sometime next week we’ll all post about the end of the book. I always like to guess what’s going on, so I’m sure this first post of mine will be mostly observations, guesses and predictions. 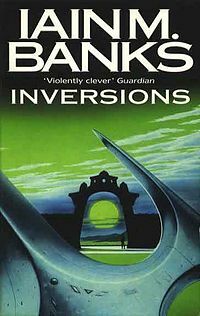 Inversions is the “culture novel that isn’t”, which makes it an excellent first Banks novel if you’ve never read him before. All the guys are gonna be talking sportsball references and other intelligentsia, and I am umm…. not going to be. When kamo was first telling me about the book, he mentioned the phrase “hiding in plain sight”. Now, he’s read this book before, so I was assuming he used that phrase for a particular reason. Remember those Hidden Pictures games in Children’s Highlights? how one large “hey! that’s a duck!” would leap right out at you, but you had to stare a little longer to find the spoon that was in the bark of the tree, or the banana that was in the swell of the waves in the lake, or the hippo that was in the clouds? Reading Inversions is a little like that, with secrets hidden in plain sight, and also simply disguised as things that wouldn’t be noticed by the other characters. 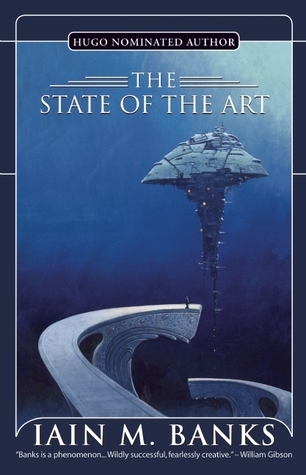 For example, this is a complex science fiction novel disguised as a rather straight forward epic fantasy novel, complete with kings, wars, torturers, apprentices, concubines and spies. Lemme ‘splain. Apologies that this sounds plot heavy, Banks is one of those writers who puts so much subtext in that there is about nine novels jammed into the 12 chapters that I read. So yeah, it’s kinda plot heavy, but that’s nothing compared to the subtext. And it doesn’t ever feel heavy. This isn’t a book that’s going to break your brain (at least what I’ve read of it so far won’t). Sharrow hasn’t done anything wrong, well, not horribly wrong. Not so horribly wrong that she deserves to be religiously and ritualistically murdered by the Huhsz. The cult has the government’s permission and approval to capture and kill Sharrow, and she’s got one year plus one day to evade them and gain her freedom. Luckily, Sharrow is not without friends and allies. Her very wealthy cousin, Geis, is only a phone call away, but Sharrow would prefer to work with her teammates. More than just a team, she is psychically linked to a small group of soldiers who now call themselves antiquities dealers. That’s a fancy name for thieving and fencing, by the way. They don’t know what the others are thinking, but they know how the other in the group will react, and sometimes that’s more important. Sharrow’s sister, Breyguhn, is a guest (or possibly a prisoner) at the Sea House Of The Sad Brothers. She’ll be released if Sharrow can bring a mythical book known as The Universal Principles to the Brothers of the House. She’s not sure if she can find it, but she owes it to her sister to free her. She thought all she had to do to escape the Huhzs was hide from them for a while. Of course it’s not going to be that easy, is it? Following vague clues about the location of The Universal Principles, her gang already planning other jobs, and there is of course, the Lazy Gun. 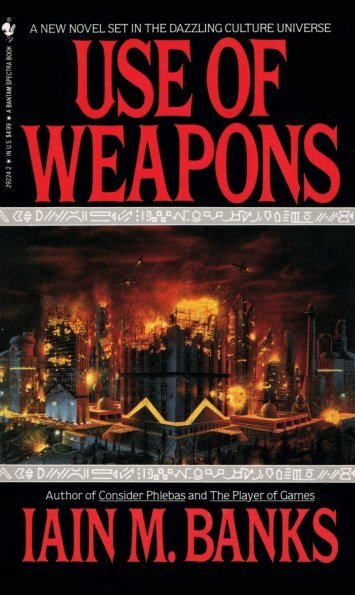 Last of it’s kind, everyone is after the unpredictable weapon. If Sharrow and her gang can find it, all the better for them as well. The Lazy Gun’s are oddly temperamental. When used, they might throw a bomb, or a piano, or a buckshot at your enemy. Possibly self aware, when Lazy Guns feel they are being interfered with, they usually blow themselves up. apologies in advance: if you’ve never read a Culture novel, this review may not make any sense to you. The only thing for it is to read a Culture novel, and then you’ll know what all the fuss is about. 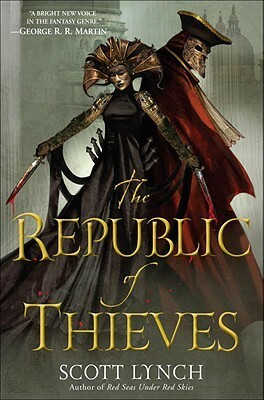 A sprawling story that mentions countless planets and conflicts, yet a plot that centers around a single individual, Use of Weapons is the intimate story of one Cheradenine Zakalwe. I’ll admit I did feel a little lost during the first 50 pages or so, but once the main story got going, I couldn’t put the book down. Throwing the reader in at the deep end seems to be a Banks thing, and just going with it, even though I didn’t yet know what “it” was, was the best thing I could have done. 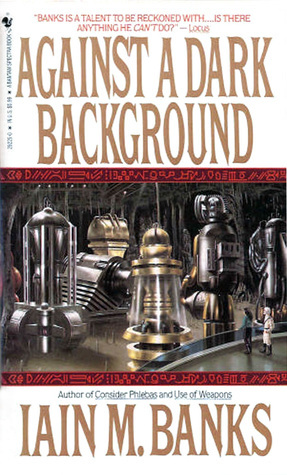 Contracted by Special Circumstances, Zakalwe is called in to do their dirty work: namely, starting wars and political conflicts on planets so The Culture can come in and save the day. Sometimes Zakalwe’s side wins, and sometimes it doesn’t, and Zakalwe spends his evenings wondering if any of this matters in the grand scheme of the universe. He’s a very private man, yearning to tell someone, anyone, of the struggles of his youth. There’s only one person in the galaxy he’s willing to tell the truth to, and an audience with her is his price for his latest job with Special Circumstances. It’s that wonderful time of the year again! When we bake cookies and get cards in the mail and forget that we need extra time to warm up our cars in these cold, cold mornings. It’s also time to talk about the best books we’ve read this year. I confess, I cheated a little on my list, I didn’t limit myself to books that came out in 2012, I’ve even got a reread on the list. Mostly space opera, a little fantasy and time travel, even a YA book made the list! In no particular order, here are my top books that I read this year, with review excerpts and links to the review should you feel so inclined to learn more about the titles that rocked my world this past year. Faith, by John Love (2012) – I read this all the way back in February, I knew right then it would make my best of the year list. An amazing debut from author John Love, Faith is a dark and tense stand alone science fiction novel. The pages drip with a danger and fear that doesn’t quickly dissipate after you’ve put the book down. This isn’t a book for everyone (that’s a polite way of saying it has lots of violence, amorality and swear words), but for those of us that like this sort of thing, Faith is quite the hidden gem. Silently and Very Fast, by Catherynne M. Valente (2012) – has anyone been putting out short stories, novellas and full length novels as fast as Valente? she’s the hardest working writer I know, and this year she got to walk away with Hugo for Best FanCast to show for it. it’s no secret that Valente is one of my favorite authors, and the Hugo nominated Silently and Very Fast is certainly her most science fictional piece. With her signature flair for poetic metaphor and lyrical storytelling, this novella follows the life of Elefsis, a house AI who was told fairytales by the human children in the house. To Elefsis, life is a fairytale, and it should have a happy ending. Of Blood and Honey by Stina Leicht (2012) – I don’t read a lot of urban fantasy, but when I do it’s a treat for it to be a beautifully written as this series (the 2nd book And Blue Skies from Pain came out later in 2012). 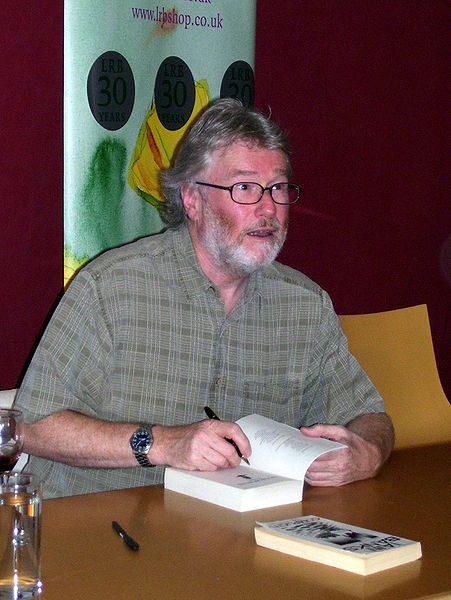 Northern Ireland, the 1970s, Liam Kelly would prefer to live a normal life. He’s not interested in getting arrested or learning secrets about his heritage. But all of those things are very interested in him, and in destroying everything in his life that he cares about. Leicht spoiled me for urban fantasy. 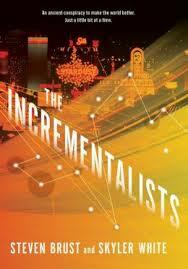 I am eagerly awaiting future novels in this series.